Good morning all! 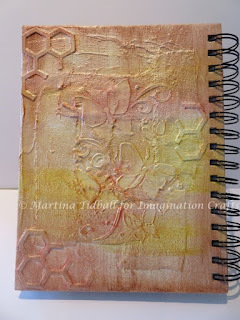 Martina here with a post explaining how I made one of the journals shown in some of the last Imagination Crafts' Hochanda shows. 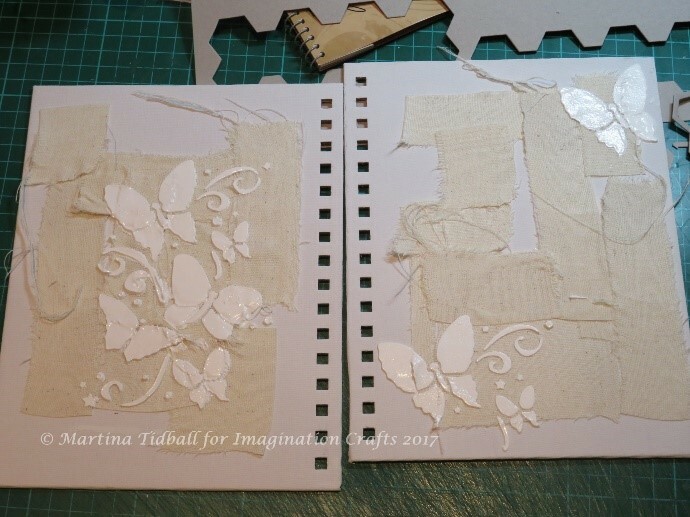 I started with one of the Journal/Planners in its ‘raw’ form and removed the front and back covers by gently prising the spine apart. 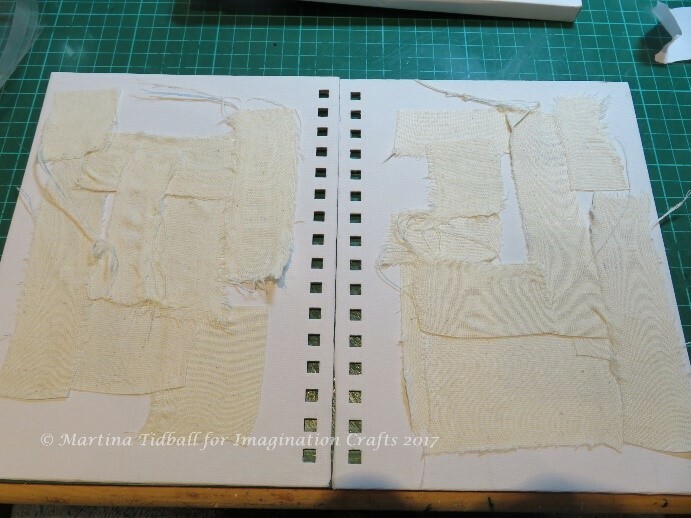 Remembering to arrange the covers in the right positions, (facing each other) I tore up some old linen-type fabric I had in my ‘odds’ drawer. I was not careful about this, leaving any ‘straggly’ bits to join in along the way as they appeared! 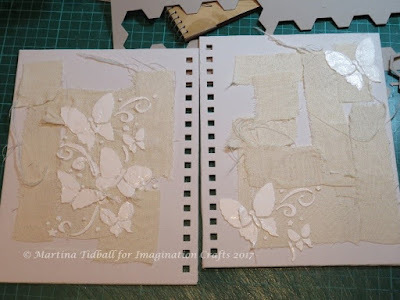 I glued all the pieces in a random pattern across the covers with Magi-Bond Glue. 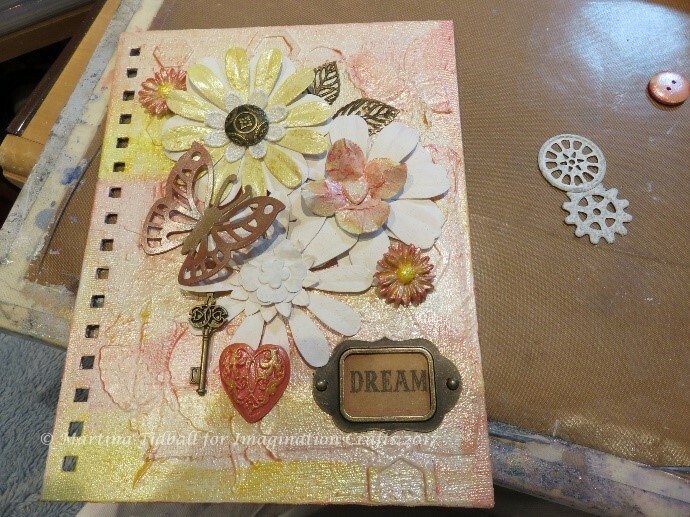 Next, I decided I wanted to build up the background texture layers of my covers a little more, so I reached for the fabulous Structure Paste and the Butterfly Stars stencil. 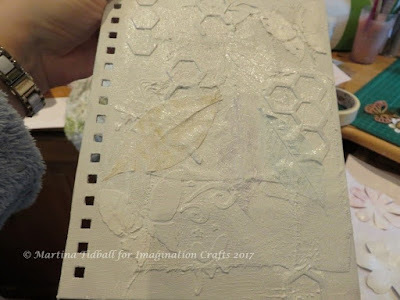 I masked off the areas of the stencil that I wanted to use and then applied the paste. It did not matter that some parts were uneven – it all added to the effect. While the paste was drying, I had a look through my craft stash and picked out a few elements I thought I might like to use on my journal cover. These included paper flowers, buttons, brads, cogs, miss-matched odds and ends and some left over Art-Cutz. 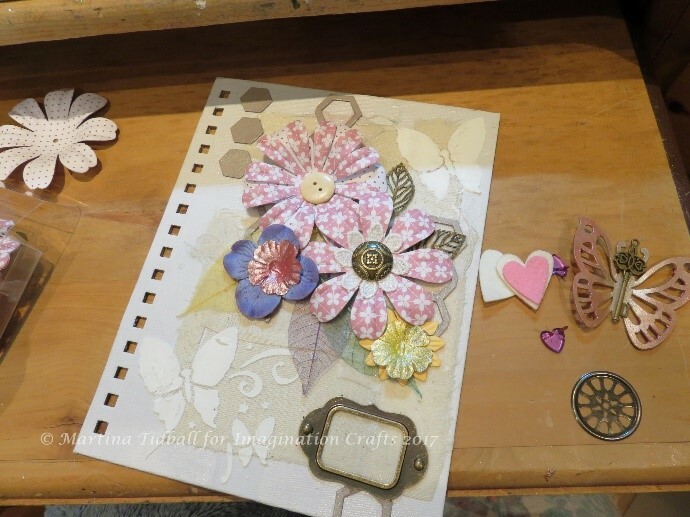 Once the cover was dry, I played about with the layout, adding and taking things away as needed. 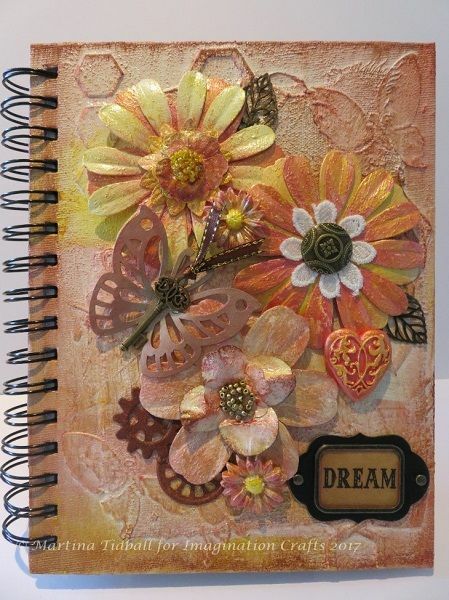 I decided I wanted to add some more ‘base’ texture, so I used some die-cut elements cut from thick card and some skeleton leaves. I then gave the whole lot two coats of Gesso, so that the colour differences were evened out. Now for some colour! I chose to use Canary Yellow, Pink Sorbet and Salmon Starlight Paints as my main tones. Going back to my elements, I painted all different items in the different paints. Things that were already brightly coloured needed a couple of coats. At this point I found some air-dry clay elements, so they also got a covering in case I fancied adding them to my collage later! 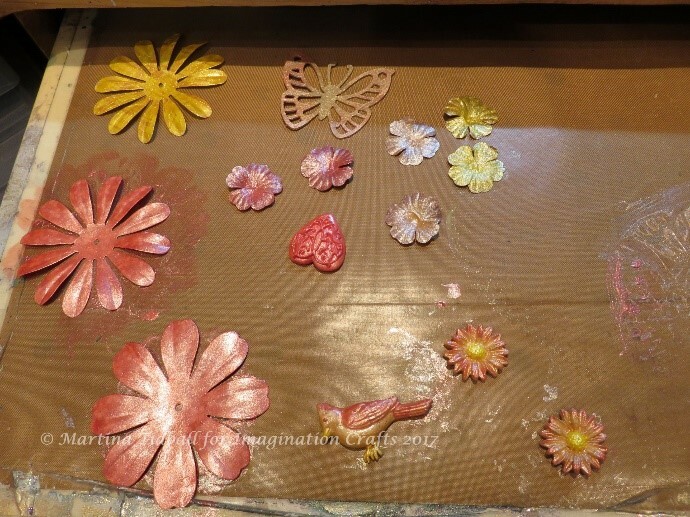 Wanting to add some texture to some of the flowers, I painted some with Blanc Rusty Patina and put to one side. 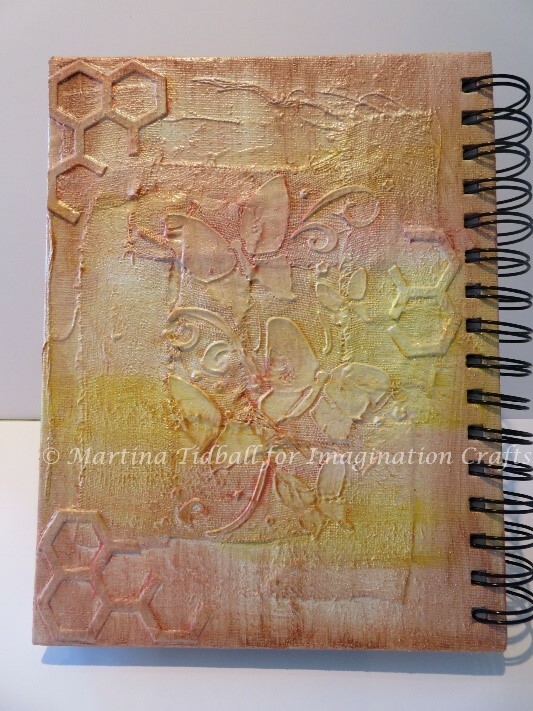 With my embellishments all drying, I started adding some colour to my journal canvases. 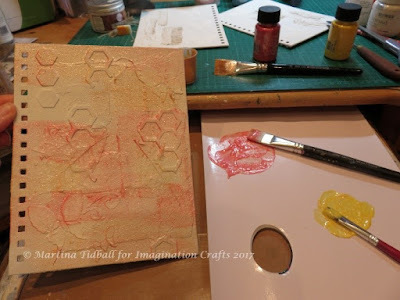 I mixed some Magi-Paint Glaze to my Starlight Paints and then painted different areas of my covers with each colour. The paints blend really well, so there was no need to be too artistic! 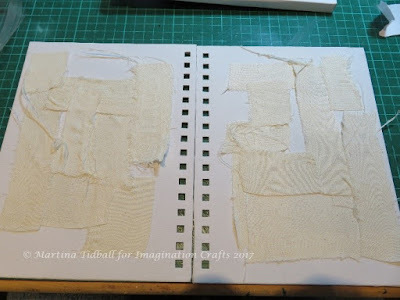 Once the covers were all painted and dry, I went back to fiddling with my layout (there was a lot of this ‘fiddling’ going on!) Looking at placement, I decided which areas needed more of which colour and added this to the white pieces as necessary. I coated my metal cogs with Blanc Rusty Patina and then decided that I actually wanted the Rustique colour, so I went over them again (I warned you there was a lot of fiddling; my excuse is I wanted to add two layers anyway for added texture!). Deciding I liked the brown tones with the Starlight colours I had chosen, I wanted to bring these into the covers themselves. Having a bit of an experiment, I lightly dry-brushed some of the Rustique Patina from the edges inwards on all sides of the canvases. 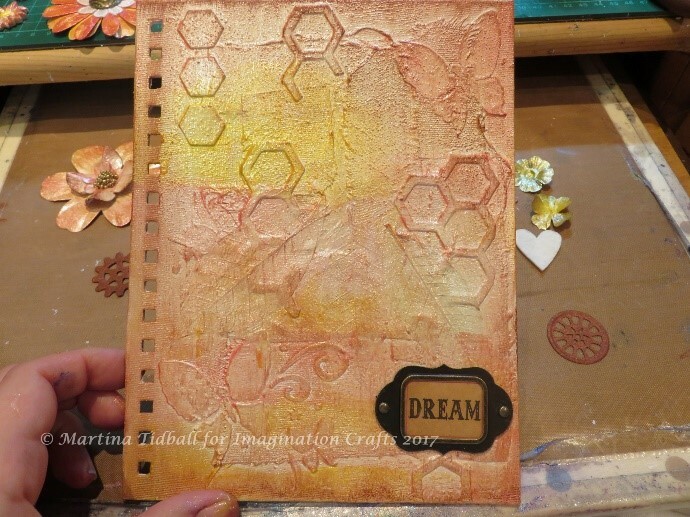 This really made the base elements pop and show beautifully. Some 3D glue gel, seed beads, ribbon, lace, hot glue, LOTS of fiddling (and goodness knows what else) VOILA...................! Thank you for reading! I hope you like it; now I think about it there are lots of elements I would change/alter, but it is always a learning curve! Do you spend lots of time fiddling or just staring at bits wondering what to do? I hope so and that it is not just me that does this; I am sure if I counted all that time up it would amount to a lot of hours of procrastination! I will see you again very soon, maybe at Ally Pally, if you’re going on the 8th of April? 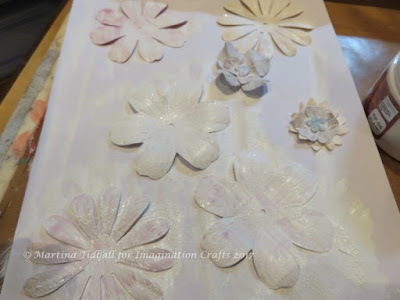 I know BJ Crafts will be there with lots of Imagination Crafts' products, so I am saving my pennies for a ‘re-stock’!